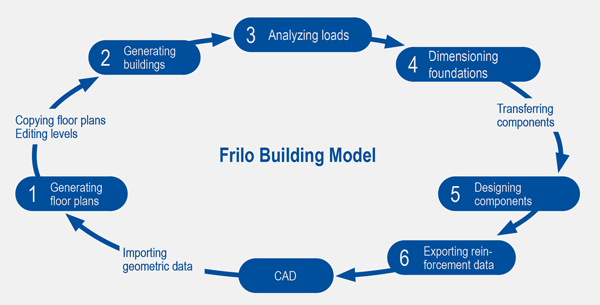 The Frilo Building Model offers a simplified approach to the analysis of an entire building. You can easily and quickly calculate residential, office and administrative buildings in a comprehensive man ner. The transfer of geometric and load data to the design applications in particular saves the user a lot of time because all parameters relevant to the design are transferred from the building model to the design application. You should note in this connection, however, that due to the two-dimensional approach, the application can only represent certain load transfer situations by means of idealized equivalents. This applies among other things to the suspension of loads over several storeys. Furthermore, the simplified approach to the distribution of the horizontal loads is only suitable for non-sway systems that are braced with wall plates because a frame effect between a column and a beam, for instance, cannot be included in this analysis approach. A storey is entered by defining a slab outline, block-outs, walls, columns, beams, parapets and other geometric particularities suc h as thickness or bearing direction areas. The desired design standard and the materials are already defined in the building model too. The load input is simplified by the definition of distributed loads over the total outline that you can enter together with the storey data. Optionally, you can define load cases that allow the consideration of a load per field already in the load analysis, for instance. As with the FE application PLT, the available input options also include concentrated, line and temperature loads in addition to the distributed loads. 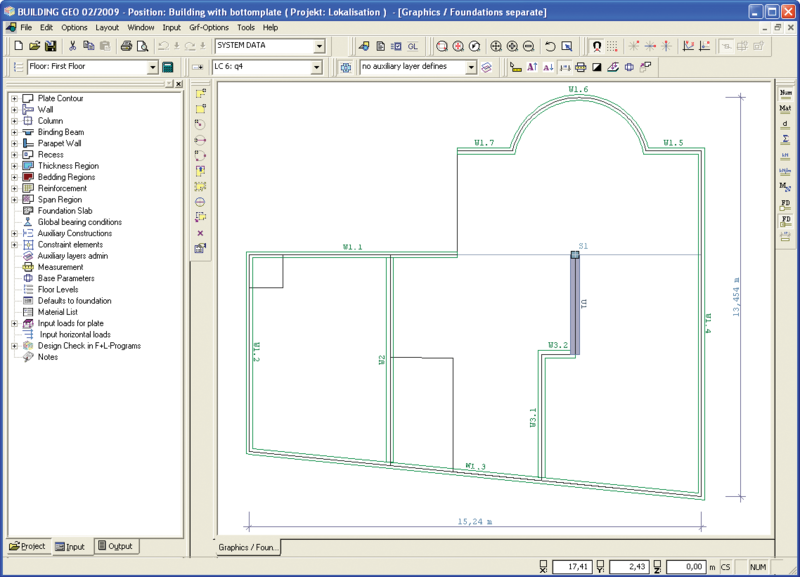 You should note in this connection that the self-weight loads of the ceiling and beams as well as of walls and columns are automatically analyzed by the application. To add new storeys you can copy a previously defined storey and freely modify the copied data subsequently. Alternatively, you can generate storeys individually on the basis of different DXF files for instance. 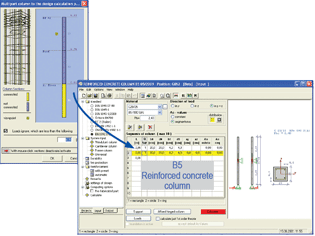 The input options allow you to define a floor slab as well as foundations on different levels, continuous vertical components outside of the slab and wall-type girders within a storey. In addition, you can apply horizontal loads to the building. As with the wind load application WL, the building model can generate wind loads in the x and y direction depending on the building geometry and the selected parameters. It is also able to analyze loads from inclinations in dependence to the computed vertical loads and you can generate additional horizontal load cases by entering manual loads. The horizontal loads are subsequently distributed over the bracing components according to the ratio of the bending stiffness. Load are analyzed for each storey. The top ceiling is analyzed in the FE application, the bearing forces are computed and transferred as loads to the next ceiling. Subsequently the next floor is analyzed and so on. When all storeys have been analyzed the total loads acting on the building down to the foundation are available. 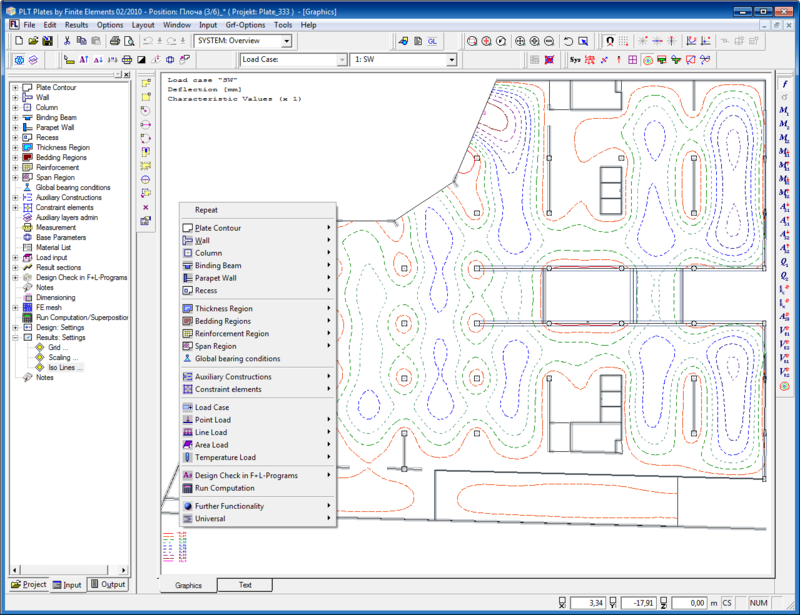 You should note in this connection that the analyses in the building model are always based on characteristic load values. 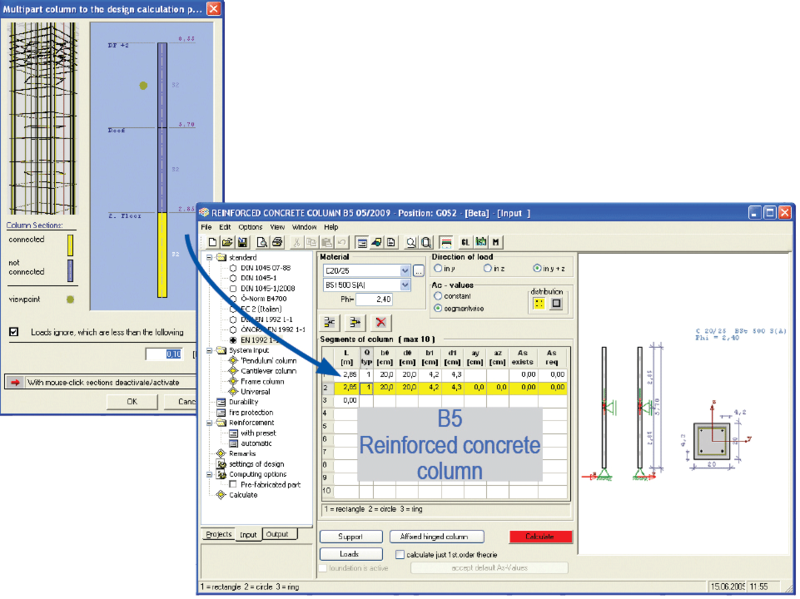 You can put out the analysis results either in the form of a summary of the vertical loads without giving consideration to the horizontal loads, or as stresses or action-effects on the individual vertical components. In addition, the application allows you to pre-design foundations on the basis of a defined bearing pressure, minimum dimensions and minimum projections of the foundation. The distribution of the horizontal loads on the bracing components is also calculated. In this analysis, the horizontal loads are distributed over the bracing components in accordance with the bending stiffness ratios for each storey. You cannot perform a component design in the building model application. The individual components are designed in the design applications The data transfer is launched by the selection of the relevant component in the system graphic of the building model and includes the transmission of the geometric data and the characteristic load values to the relevant design application. The design application generates the load combinations relevant to the component and performs the component design. The design results are saved in the form of a component item. 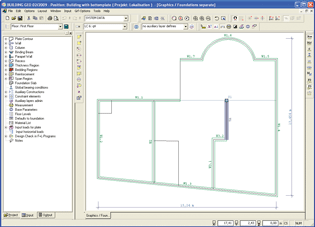 We would like to point out in this regard that all functions for the editing of the item are available in the design application when it was launched out of the building model application. After the completion of the design the results can be exported in the usual manner. You can transfer reinforcement data generated by the PLT, B5 and DLT applications to the CAD applications Allplan by Nemetschek and isb cad by Glaser, for instance.